This Leftover Ham Alfredo Pasta recipe is a post-holiday, leftovers-gone-right, comfort food. 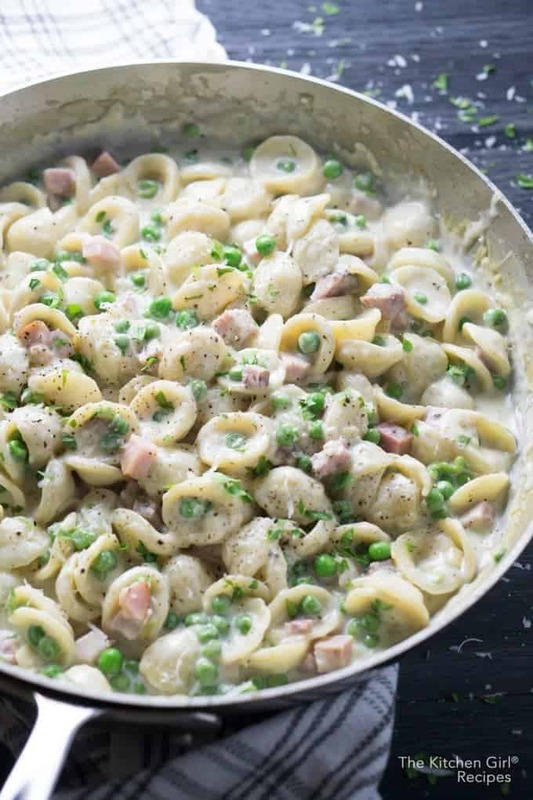 It has leftover ham, sweet peas, pasta shells, and a creamy, dreamy alfredo sauce. Repurpose your holiday ham in one pot, in 20 minutes. Do you know what to do with leftover ham? Last year, I created a recipe around a hunk of leftover ham from Sunday’s holiday dinner with friends. Guys, this is my jam! I tossed a few, simple ingredients into one pot and made dinner magic happen. Meals using leftovers don’t always go like this. But, with this recipe, it totally went like this. Talk about a no fuss dinner! This dish requires a few, quick prep steps, like chopping onion, grating garlic, and dicing ham, then you’re off to the races! To do so, you can seal leftover ham in a freezer bag and store immediately. Be sure to include a package date on your bag, and consume the ham within 6 weeks of that date to avoid freezer burn. When you pull the ham out of the freezer, go ahead and make my alfredo pasta recipe! Want more recipes that utilize protein leftovers? 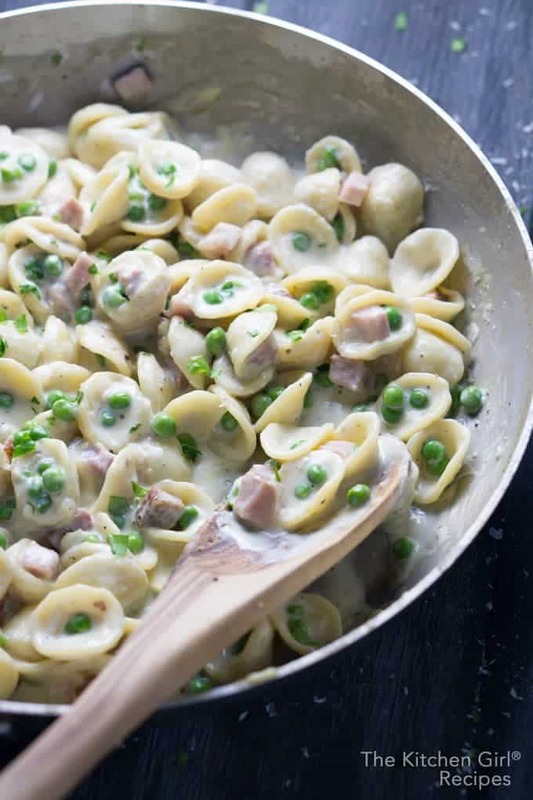 Cooked ham, frozen peas, oriecchette pasta, and creamy, dreamy Alfredo sauce...all in ONE pot...only 30 minutes! In an 11” stainless skillet on medium flame, heat OLIVE OIL until shimmering (about 2 min). Add ONION and GARLIC; saute until tender and fragrant (about 3 min). Add CHICKEN BROTH and PASTA SHELLS; increase heat to high until boil occurs. Reduce heat to medium and cook until pasta is just slightly underdone; stirring frequently to avoid pasta sticking to skillet (8-12 minutes). Add PEAS, HAM, and HALF AND HALF; bring to gentle boil for a minute. Reduce heat to med-low and simmer until pasta shells are fully cooked; stirring frequently (3-5 minutes). Fold in PARMESAN CHEESE, season with BLACK PEPPER, and garnish with fresh PARSLEY; serve warm. I didn’t salt this recipe due to the high sodium in the chicken broth, the ham, and the parmesan cheese. Yum! 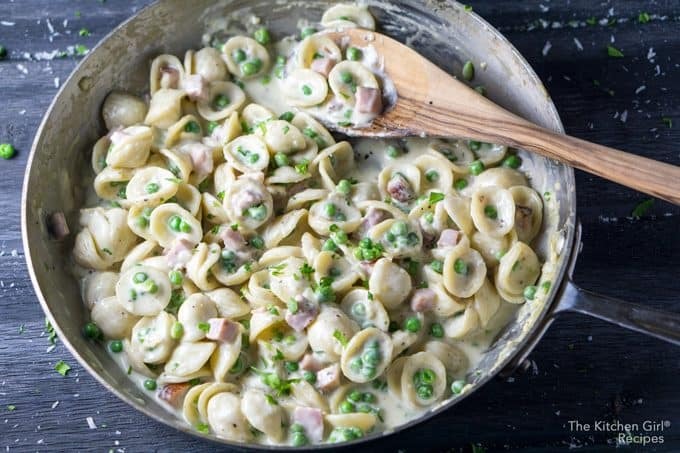 I love ham and peas together in a pasta dish. Definitely would like a plate of this right now! Love hearing that, Gabi! Thanks for the vote...and I hope your hubby loves it! Love the idea of repurposing Thanksgiving leftovers into a great meal. This sounds like a real crowd pleaser. My whole family loves this.. even the picky kiddos! Thanks for the tasty recipe! You're so welcome, Kim. And yes...go kiddos! What a great use of leftover ham! My go-to is always omelets, but I love this dinner idea and will be trying it next time I have leftovers! Awesome...love hearing that Soniya! Hope they do love it...thanks! Haha yay Lisa! I love sneaky ingredients...and the peas are my favorite ending to this dish :) Hope they love it! I love easy one-pot meals that reinvent leftovers! What a fun, and delicious sounding, recipe for leftover ham! This looks so good, but also so easy! Perfect for a quick weeknight meal! This is exactly what I"m in the mood for today! 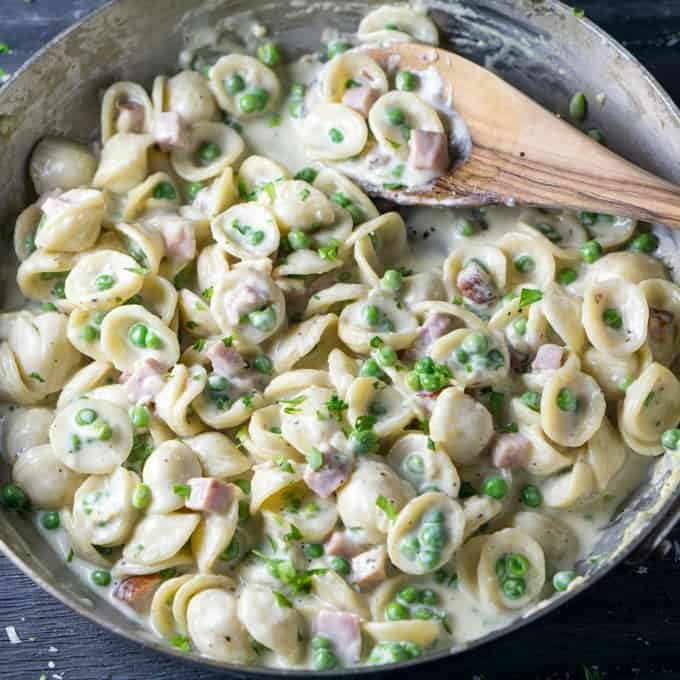 I mean, alfredo is always a winner, but the peas and ham make it more of a meal! YUM! Yum! This looks like the perfect comfort food for a cold day! I love peas and ham together! This would make the perfect, quick and easy, weeknight meal. I have to try this ASAP! Yummy! This looks so yummy and comforting, perfect for holiday leftovers. What a great way to use up leftovers and satisfy our cravings for good old-fashioned comfort foods!! SCORE!